We've been obsessing over Rodan + Fields Active Hydration Serum and it's time we share the ins and outs of how we get the dewy glow everyone's chasing. One of our secret weapons, especially for clients who have dry skin, Active Hydration Serum is must have layer for all makeup applications. 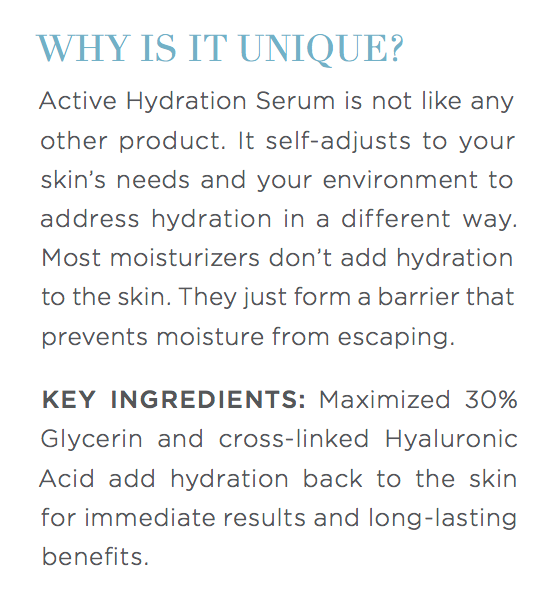 What is Active Hydration Serum? Active Hydration Serum works immediately, lasts all day, and most importantly, it builds moisture over time. It's a layering super-serum that utilizes Rodan + Field's proprietary 3D3P Molecular Matrix that acts as your skin's personal water reservoir, drawing and locking in moisture from the air to nourish and replenish your skin as needed. Skin is immediately softer, smoother and more radiant-looking, and continues to improve over time. Welp, that's a lot of fancy science words 😂 read on to see what and why we love it in every day use and for makeup applications. 💦 Immediately hydrates skin to its optimal hydration level after the FIRST use. As millenials, we want things *NOW*, usually for true skin improvement we have to wait, but not with AHS! We get awesome results in seconds! 💦 Self-adjusts to each individual’s skin needs and environment to deliver continuous hydration throughout the day. Uhhhh... customized hydration, what?! Like couldn't have dreamed his up! 💦 Forms a water reservoir on the skin’s surface, allowing it to take in hydration as needed and continues to build it over time. Who knew this was possible? We were happy with immediate results, but the fact that Active Hydration Serum keeps working over time to keep skin at peak moisture is insane and just adds to our obsession! Hydrating and moisturizing address dryness in different ways. Hydration adds water to the skin, while moisturizers do not add water to the skin, they form an occlusive barrier on top of the skin to seal in the moisture that is already there. 🏜 As the outer surface becomes dry, cell turnover reduces which results in skin that is more prone to sensitivity, lines and wrinkles, and is less receptive to skincare products. We love products that speed up cell turnover for this reason, so we certainly don't want to be fighting against these products by having dry skin. 🏜 As skin ages, it requires more hydration to perform optimally, and can become more difficult for skin to taken in hydration or other skincare ingredients. One more things to add to the list of again woes. 🏜 There is a misconception that only visibly dry or older skin needs hydration. All skin types, even oily and acneprone skin, can benefit from additional hydration to perform optimally. In fact, oily skin actually produces more oil when it’s dehydrated to compensate for its hydration needs. R+F’s proprietary 3D3P Molecular Matrix reengineers the best super-hydrators – maximized 30% Glycerin and cross-linked Hyaluronic Acid. Active Hydration Serum adds hydration back onto the skin to provide instant results and long term benefits. Glycerin: Maximized 30% concentration draws in moisture from the atmosphere and creates a water reservoir on the skin’s surface to deliver continuous, all-day hydration as needed. Hyaluronic Acid: Powerful humectant that attracts and holds 1,000 times its weight in water. Get your hands on Rodan + Fields Active Hydration by clicking here and then let us know how you love it!